Francis Bernadone was born at Assisi in 1182 to parents who were rich merchants. He chose to live in poverty, in joy he sang of the Most High on the roads of Umbria in central Italy. Queen, holy Mother of God. Francis preached to the rich and poor, he recommended poverty which consisted of leaving everything and owning nothing; neither one’s own life or goods. To all, he recommended the life of a son of the Church obedient to the Holy Father. Many joined him incuding nobles, middle class and peasants . Francis then founded the Order of the Brothers Minor. Later, Claire of Assisi and her sister Agnes, from an aristocratic family, also wished to live according to his ideal. They became the “Poor Ladies” or “Clares”. Men and women, having a family and professional life, also wished to live in the spirit of St. Francis. They became the Third Order of Saint Francis. This Third Order expanded just as the first two orders had, first in Italy, and then in Germany where Elizabeth of Hungary lived. Daughter of Andrew II, king of Hungary, and of Gertrude of Merany, Elizabeth was born in 1207 at Presburg in Hungary. In 1220, when she was 13 years old, she married Louis IV of Thunngen and lived at the Chateau Warlburg near Eisenbach. She met the first Friars Minor who came into Germany. One of them introduced her to the spirit of St. Francis. Her husband died in 1227 on a crusade and she found herself at 20 a widow with three children. She consecrated herself to the service of the poor. In them, she venerated Christ. Encouraged by the Friars Minor, she lived in poverty. She used her income to build a hospital at Marburg. A little later she began living there with other companions after having been clothed in the habit of a Third Order Franciscan. She died at Marburg on November 17th 1231 before she was 24. Elizabeth was a contemplative woman, totally given to the poor and the rejected. She would become the patron of the Third Order Regular of Saint Francis which gave rise to numerous religious communities. Around Francis, the Brothers became more and more numerous. He blessed them and sent them to preach the Gospel. Italy was not large enough. The heart of Francis had to overflow to the world. Francis particularly loved France. His roots were there. His mother, Lady Pica, was from Provence. He decided to go to France but he was prevented. He sent in his place several of his companions with Brother Pacific. They arrived at Vezelay in 1217 where they established the first Franciscan monastery in France. It was called “The Cordelle”. In 1219, Brother Pacific came to Paris, then to Saint Denis. About 1223, he found himself at Lensen-Artois in north of France. Under the inspiration of Brother Pacific, who had been named Provincial of the Order in France, the brothers and their monasteries multiplied. The needs of the French people were great. Brother Pacific brought from Italy some women who worked to relieve the misery of the people.They formed the Third Order Secular. According to an ancient tradition, the first Sisters of the Third Order, called the Grey Nuns, established themselves at Saint-Pol-sur-Ternoise in the north of France around 1223-1224, before the death of Saint Francis (1226). In 1430, the Black Sisters of the Third Order of Saint Francis came from Saint-Omer and established at Saint-Pol where they lavished their care on the sick. From Saint-Pol some Sisters were sent to Bethune, to Arras, to Lens….. others went to the north and to Belgium…. others to Picardy. Rapid development continued from the thirteenth to the eighteenth century. After the thirty Years’ war, about 1650, there were seventy convents in Flanders and nearly 1200 religious. Later, some following the example of Elizabeth of Hungry, adopted a Rule of Life, retired into convents and gave themselves to the works of mercy. They formed a Third Order “Regular” (one which followed a rule of life). They generally dressed like the widows in the places where they lived. Among these houses were the seven autonomous houses of Pas-de-Calais which, after the revolution, reclaimed the spirit of St. Francis of Assisi and became the beginning of the Congregation of the Franciscans of Calais. In 1408, the hospital of St. John was destined to lodge, warm, and nourish poor pilgrims for one night. In order to continue receiving the poor and the sick, they called upon the Sisters of the Faille in 1434. in 1636 they were outstanding for their dedication during epidemics, especially the plague. The civil hospital was entrusted to the Franciscan Sisters in 1429. The Franciscan Sisters called, Sisters of the Cell were established here and worked with orphans. The hospital was served by lay nurses. In 1495, they asked the Grey Nuns to come from Saint-Pol. They had to “take in and care for all the poor strangers passing and returning, even the contagiously ill to visit and protect the sick in the city, the suburbs, and wherever they were needed, day and night, and even bury the dead”. In 1555, the Franciscans brought the Black Sisters of Saint-Pol, also called the Sisters of the Cell into the Hospital. They took charge of the “care of the sick, and the instruction of children” this work grew and developed until the Revolution. In 1339, John Chariot, a businessman from Arras, built a hospital entrusted to twelve widows. In 1556, they were replaced by a dozen Franciscans of the Cell who came from Saint-Pol and who are called Chariottes. The religious were to “care for the sick and give lodging to poor travelers”. In 1659, some pious, charitable women took charge of the Chamber of the poor. In 1755, they were replaced by the Daughters of Charity expelled by the Revolution. The Franciscans arrived in 1807. The communities of the Grey Nuns and the Black sisters were dissolved. The Grey Nuns even had one of their members martyred: the Superior, arrested, she was detained at Saint-Pol and at Frevent, then transferred to Arras where she was guillotined. After these events, the different communities had great difficulty refounding themselves since their members had been dispersed. In certain places, they continued to care for the sick. Gradually some houses took up the common life and resumed their activities. But their number was reduced and they were answerable to administrators. At Saint-Peter-of-Calais, the government asked for four Franciscans, some from Bethune and others from Saint-Omer, to come to relieve the Hospital and take care of abandoned children and elderly. In 1852, Abbot Adolph Duchenne was the chaplain of the Franciscan of Saint Peter’s Hospice in Calais. These Sisters wanted to join the Third Order of St. Francis. On October 26, 1852, Father Lawrence d’Aoste, Provincial of the Capuchins of France, officially incorporated the Sisters of the Hospice with the Third Order. Monsignor Parisis, Bishop of Arras, spoke of the “union” of all the Franciscans of the diocese to form them into only one Congregation. On December 4, 1852 he commissioned Abbot Duchenne to make this project happen. Abbot Duchenne began the visitation of the seven houses and the 75 Sisters with the Abbot of Tour-Auvergne, later Bishop of Bourges. On February 8, 1853, the Sisters accepted the union and renewed their profession. On April 10, 1854, an imperial decree recognised the new Congregation under the name “Sisters of the Third Order of Saint Francis of Assisi, called the Franciscans of Calais”. On May 30, 1854, Monsignor Parisis, in accordance with the unanimous vote of the Sisters, named as the first Superior General, Mother Louise Mabille, then Superior of the Hospice of Calais. The solemn decree of definitive approbation of the Congregation was dated March 15, 1892. From this union of the seven houses was born the Congregation of the Franciscan of Calais whose members observe the same Rule, the same Constitutions, wear the same habit, adopt the same customs, and recognise the same Superior General. Mgr Peter-Louise Parisis, Bishop of Arras, from 1851 to 1866. As he made his first pastoral tour of the chief cities of the diocese, Mgr. Parisis was struck by the isolation of certain religious houses. He met the Franciscans at Arras, at Lens, at Bethune, at Air-sur-la-Lys, at Saint Omer, at Montreuil-sur-Mer, and at Calais. Among them, they had no linkage, no connection. Each house was independent and autonomous, as well as having its own customs. Each lived its own lifestyle hardly compatible with the obligations of religious life because they were under the governance of the local administration. Mgr. Parisis had to point out that the communities were responsible to the Church and their superiors and not to a civil government. His objective would be to reunite these Franciscan communities and to re-establish a mother house with a Superior General to safeguard their independence and their dignity. Mgr Adolph Duchenne, was born at Boulogne-sur-Mer to a family of shipowners, his father having been a captain for a long time. On the day after his ordination in 1837, he was sent to the General Hospital of Saint-Omer where he took care of the orphans and abandoned children. Three years later he arrived at Calais… where he would remain until his death. He knew the Franciscan Sisters at Saint-Omer and at Calais very well, and sensed that there were things weakening their religious spirit; the time of prayer was reduced, the strictness of the novitiate was relaxed… he had the same idea as Mgr Parisis and wished to make the pure religious spirit flourish again as well as placing the Sisters under the authority of only one superior. Mgr. Duchene went to live with the Capuchins, who had returned to Paris after the Revolution of 1848, in order to immerse himself in their spirit. He studied the Rule of the Third Order with the Superior of the Hospice of the community at Calais. Mother Louise Mabille, led all the members of the Calais community to renew their vows to “live in obedience, without property, and in chastity, following the Rule of the third Order of Saint Francis..”..this incorporation took place on October 26, 1852. Mother Louise Mabille, was born at Boulogne-sur-Mer on May 22, 1799. She received the habit of the Franciscan Sisters of Calais, was professed on October 4, 1825, and then was appointed to the civil hospice in Calais. Named Superior of the Hospice in 1851, she began the work of reuniting the seven autonomous Franciscan houses of Pas-de-Calais. At the same time as Mgr Duchenne, she studied the Rule and probed the Franciscan spirit. Mother Louise was named first Superior General by Mge Parisis, on May 30, 1854. she favoured the union by her calm and self-effacing temperament, by her prudence and wisdom, and by her will. Mother Francis of Saint John, was elected Superior General in 1864 upon the death of Mother Louise. Of a very upright nature and full of good sense, she gave evidence of humility, detachment from herself, and a great spirit of faith. 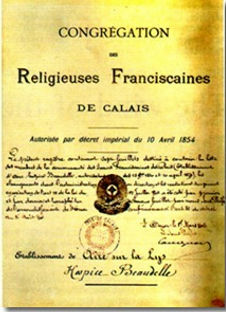 The Congregation was born at Calais. The Hospice, the first house, was already under the Community of Saint Peter-les-Calais. It was there that Mother Louise lived and worked with Mgr Duchenne to further the union of the seven houses. In 1856, the mother house and the novitiate were located in another part of the city because of the lack of space of the first house. Throughout its history, the congregation had to face difficult trials: the war of 1870, those of 1914-1918 and of 1939. the mother house of Calais and its chapel were completely destroyed in May of 1940. The only trace of this catastrophe was the head of a very beautiful statue of Saint Francis which adorned the chapel. After the war, the house of Desvers which had been requisitioned was given back to the Sisters. In September of 1945, Mother Osmanne, Superior General, decided to make it the mother house and to rebuild the novitiate which had been evacuated. In 1965, the Franciscans of Calais took the name “Franciscan Missionaries of Our Lady”. In 1874, the Superior General and her Councilors were established at 3 rue Dombasle in Paris. From the first years after the union of the seven houses, they were called the Franciscans of Calais. Subsequently, they founded other houses in France, then in mission countries. From 1854 to 1939, sixty houses were founded in Francis and spread among several dioceses. The Sisters work principally in serving the sick, the elderly, their older sisters, in pastoral work, in religious education, in enlivening the liturgy, in sheltering the outset. The first Sisters left four years after the death of Mother Louise Mabille. They devoted themselves to the service of the sick, the poor, and children. The novitiate was opened in Porto and many foundations followed. During the Revolution of 1910 most of the houses were closed. The novitiate was later reopened in 1926 at Tuy in Spain. At the time of the Spanish Revolution in 1936, it was moved to Sato Tirso in Portugal, and finally to Gondomar in 1963. Today, the Sisters are engaged in teaching, educating young people and children, pastoral work serving the sick in hospitals, serving the elderly, in nursing Homes. The first house was founded in Cord. The novitiate established in Thurman (England) in 1951, was moved to Langholm in Scotland in 1961, then to Mullingar in Ireland and finally to Dublin in 1981. The Sisters work in hospitals in nursing administration, visiting the sick etc, and in teaching. In 1911, six sisters arrived in Louisiana. In 1923, the Hospital of Our Lady of the Lake was founded at Baton Rouge. In 1949, the Hospital of Our Lady of Lourdes was opened in Lafayette. The provincial house and the novitiate were erected in 1967. Today, the Sisters are present in the hospitals as Nursing, administration and pastoral work. In 1988, the mission in Haiti. In 1911, ten Sisters arrived at Rosario. They worked there and also at Totoras as teachers. In 1949 a novitiate was opened at Rosario. Today the novitiate is in Cordoba. The sisters are working in childcare and teaching the young, in pastoral work, and conducting spiritual retreats. The first foundation dates from 1965 at Aracaju (State of Sergipipe) in North-Cast Brazil. The first mission was opened at Obock in 1888, then moved to Djibouti in 1899. The Sisters exercised their ministry in teaching, in a day nursery, among the sick in hospitals, and in a dispensary serving the poorest. Four sisters went in 1935. A novitiate was opened at Vila Pery in 1968. Because of the political situation, several houses had to be closed in 1975. Today the Sisters work in teaching, pastoral work, among the sick and in the promotion of women. The first Sisters opened a school at Nossi-be, then at Ambanja. The novitiate was opened in 1963 at Tananarive. Today the Sisters work with children, with the sick, with lepers in pastoral ministry and in promotion of women. The Franciscans of Our Lady of the Angels. The Franciscans of Nazareth (Ethiopia). The Sisters of Our Lady of Treille. The Franciscan Sisters of Our Lady of Hope. As much as possible, with the other branches of the Franciscan family, they reflect together, recalling and deepening their common vocation: to follow Christ and to live the Gospel according to the spirit of Saint Francis and of Saint Clare of Assisi. For 150 years the Franciscan Sisters of Calais, now the Franciscan Missionaries of Our Lady, tried to live the charism left to them by Mother Louise Mabille and Father Duchenne, and after them the first Superiors General. Meditation on the Scriptures in the living tradition of the Church, of the writings of St. Francis of Assisi and of the Superiors General help the Franciscan Missionaries of Our Lady to transform themselves in a permanent conversion. THE FRANCISCAN MISSIONARIES OF OUR LADY are called to witness to the face of Christ in the world, whether they live in community or outside. They are also called to discover the face of Christ in every person and in every culture. The missionary spirit calls us also to go to distant countries and to remain always, in spirit and heart, open to the needs of people and of the universal Church. Obedience allows us in our daily life to follow the will of the Father without ceasing. It is expressed by our response to the demands of the institute, by mutual obedience, by the joyous gift of ourselves, by accepting the differences and the trials of life. It is the source of joy and witnesses to the life to come. Young women interested in our life can spend a brief period of time in one of our communities before committing themselves to the various steps which are part of beginning formation. The formation period for becoming a Franciscan Missionary of Our Lady extends for several years and continues for the rest of ones life. Postulancy is a time for deepening ones faith for getting to know one another for discerning a vocation, progressively discovering the demands of religious life. The candidate begins her first steps in a life of prayer in the community and in the apostolate the postulant lives in a community and can stay from six months to two years. The novitiate is a time of intense preparation for religious consecrated as a Franciscan. It is an experience lived in relation to God are in religious community life of openness to the mission of the church of deepening the spirit of St. Francis and of the Congregation. It lasts for two years. One of which is spent in the novitiate community. Once this is finished, one makes temporary profession which includes the three vows of Obedience, Poverty, and Chastity. Formation continues during this period of temporary vows (for a minimum of three years) to prepare for perpetual profession. This is the definitive commitment to follow Christ in service of the Church and humanity. Spiritual formation, doctrinal and practical, is pursued all of one’s life. We are called to grow in faith, in hope, and in charity, and to develop all of our gifts. Our tradition places great importance on prayer in common. As a community we pray the Office of the Present Time, the official prayer of the Church. To this we add time for personal prayer following our apostolic work. Prayer is for us a daily reality. It nourishes the desire for “the Spirit of the Lord” and invites us with Francis of Assisi to discover God in everyday living and to bring that life to prayer. Holy Mary, our Lady, clement and loving. May we be your prayers obtain celestial glory. Hear us, Mary, for your son honours you and refuses you nothing. Save us, Jesus, Messiah, we for whom the Virgin Mother Prays. December 8th The Immaculate Conception of the Virgin Mary. Patroness and Queen of the Franciscan family. We are called by the Lord to live in community. This implies mutual personal relationships among us. a positive attitude toward welcoming the other Sister and accepting her in her concrete reality, even recognizing her right to be different. Sharing poverty and a life close to the poor out of love. The Generalate house in Paris is the symbol of the entire Congregation, Residence of the Superior General and of four councilors. It is the source from which comes our spiritual energies. All the Provinces and Regions are linked with the general house and the government of the Congregation. In a family spirit, it receives and communicates information from the Provinces and Regions. It is there also that sisters are welcomed from other countries. Some forms of commitment present challenges that we wish to respond to together. These challenges should awaken new ways to exercise our charism and our spirituality in effective solidarity and in sharing the riches peculiar to each one, whatever his or her place in the Church.